This no bake energy bar recipe has been sponsored by Stonyfield Organic yogurt. 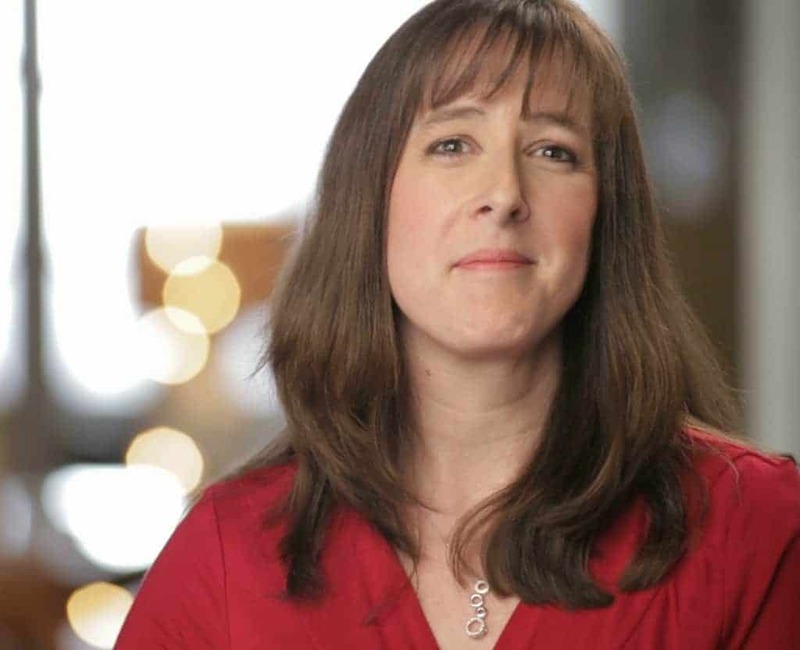 As a Stonyfield ambassador I receive product coupons to facilitate my recipes. All opinions expressed here are my own. Several years ago, my husband took up running. Since then, I cannot even tell you how many miles he has run…around a track, through the neighborhood, over park trails, and through Disney during one of many marathons. As any avid runner can tell you, when you are training it is incredibly important to make sure you keep your body well fed. My husband is extremely thin and during marathon training, the weight drops off at an alarming rate. Yes, I kindof hate him for that! He gets really sick of protein drinks so I am always looking for creative ways to pack protein and carbohydrates into his diet. 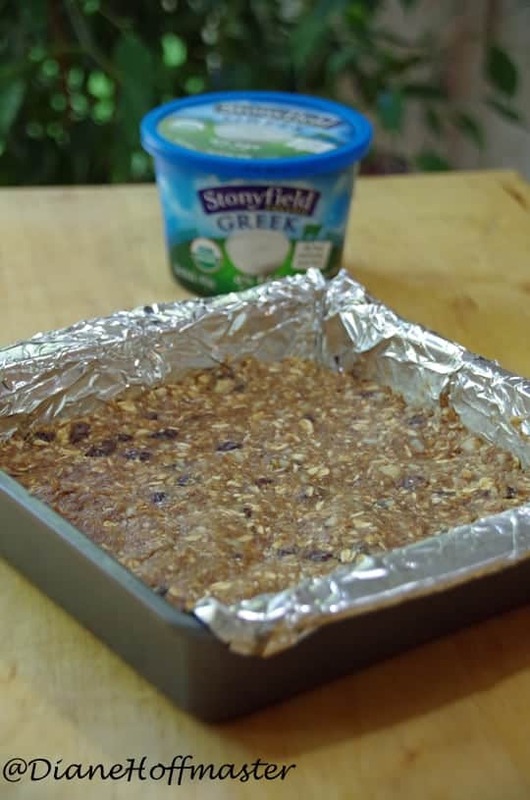 This no bake energy bar recipe uses a combination of nuts, dried fruit, whole grains, honey and Stonyfield Greek yogurt to pack a whole bunch of protein and carbs into one very tasty little morsel. If you are looking for a no bake energy bar recipe to fuel your next workout, this might be just the thing for you. They also make a great afternoon snack for hungry teenagers who come home from school complaining that they are so hungry they are going to faint. Yes, teens are all about the drama! I hope you enjoy this energy bar recipe as much as my family has. Hopefully it will help you run faster, reach higher, and push harder during your next workout! 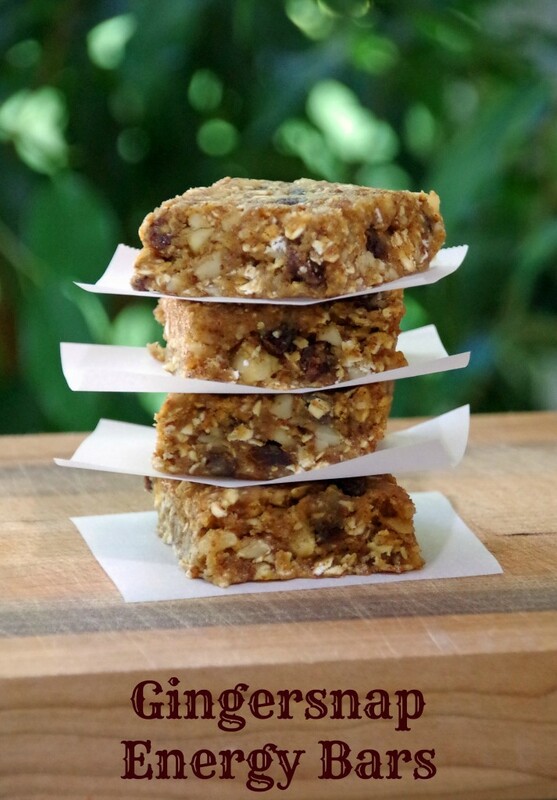 Protein and Carbohydrates all packed together in one delicious no bake energy bar! In a large mixing bowl combine oats, graham cracker crumbs, ground flax seeds, cinnamon, ginger, and nutmeg. In a food processor, combine macadamia nuts and crystallized ginger. Process until nuts are finely chopped. Add this to your dry ingredients. Into the dry ingredients, add the almond butter, honey, raisins, and yogurt. Mix until combined. If dough is too dry add more yogurt. If dough is too wet, add more oats or graham cracker crumbs. You want a dough that is damp but that holds together well. Take a 8 x 8 pan and cover with foil, leaving ends to overlap to use as handles later. Spray foil with non stick spray or brush with a small amount of olive oil or butter. Press the dough mixture into the pan until the top is flat and it reaches all the corners. Chill for several hours before cutting into bars. That sounds really good. I haven't tried making my own energy bars yet because I thought it was difficult. I can totally do this though.